Down by the sea, in her friendly but spider-infested studio in West Sussex, Jenny Lock is often to be found surrounded by a plethora of paintbrushes, tubes of paint and canvases of varying sizes, some of which are almost taller than she is. Perennially fascinated by the mutable nature of the English weather, Jenny finds that the ever-changing light over the sea provides her with a constant source of inspiration. 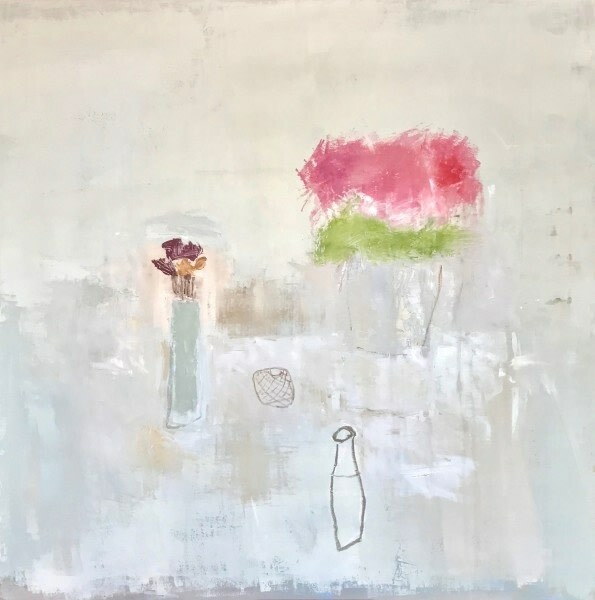 An unmistakable calmness pervades her canvases and her palette is muted and soft. The late art critic Robert Hughes once described Howard Hodgkin’s work as “feelings declared in colour” – an observation that could readily be applied to Jenny’s work. You started painting quite late in life - can you tell us a little about your earlier work as a freelance designer and illustrator? After leaving Epsom School of Art and Design, having gained a Distinction in Fashion and Illustration, I worked from home for fashion forecasting companies and I also did some freelance illustration for magazines. After collaborating with a designer, we went on to win the prestigious ‘Perrier Award’ for the best shop window display in the Kings Road, Chelsea; it was a while ago now and unfortunately I’ve forgotten the name of the store! After several years, I became quite disillusioned with fashion and found myself becoming more and more drawn to painting. Having completed a course with the Open College of the Arts my tutor, the painter Jim Cowan, encouraged me to apply to Chelsea School of Art. Enrolling at Chelsea College of Art as a mature student was a big step. What was it that spurred you on? I had always enjoyed painting and, once the children went off to university and I found that I had more time, I began a five year part-time degree course, ‘The Practice and Theory of Fine Art’. The course was amazing and the students were from all walks of life and of varying ages. We gained as much knowledge and support from each other as we did from our tutors. Does the creative gene run in your family? I am one of six children from a working class background; my parents didn’t have much spare time to indulge in creative pursuits themselves but they actively encouraged us in our artistic endeavours. My mother taught herself to knit and used to make fantastic highly intricate garments. My son, Sam, is a painter in his own right. I believe that we all possess a creative gene whether that manifests itself in painting and art, textiles, pottery, gardening, cooking, writing, poetry, etc. Is it true that artists need to be very self-disciplined? I think it probably helps! And finally, Georges Braque, the 20th century French Cubist painter and collagist, believed that “the painting is finished when the idea has disappeared”. Do you agree with this? When I begin a painting I don’t really like to know where I’m going with it. I just have an idea, say of a colour, and as it progresses I try not to worry too much about how it will turn out or what it’s purpose might be. I need to trust my instinct. Eventually, the painting will start to speak to me and it is only then that the process of deciding composition and form takes place. This is my preferred way of painting but occasionally I will paint something figurative and a bit quirky. This may happen when I feel the need to be more in control of a picture or if I’ve been inspired by the form, shape or colour of an object. First and foremost though I love the way an abstract painting will allow my imagination to flow and ideas to formulate. For me, finishing a painting is probably the most difficult part - a painting can often be spoiled by overworking it - so yes, I agree with Braque.